Secret boards are boards that are not seen by others Secret boards do not turn up in searches, categories or feeds. The only way another user can see your secret board is if you make your secret board a community board or invite others to pin to the board. During the holidays, we gave everyone a few more secret boards so people had a place to plan their gift lists and holiday surprises. Pinterest used to have a limit of three, then six secret boards per user, but recently removed that limitation. Now users can have as many secret boards as they wish up to the account limit of 350 boards of any kind. Users can belong to any number of secret boards created by others. Brands sometimes set up secret boards to communicate or share a team project. A retail outlet or marketing team might use a secret board to set up a promotion or new product line in advance of a release date. There are a few ways to create a secret board. The first is to go to your profile & pins page (account home page). From there, go to the bottom of the page. Here you will see any existing secret boards you already have. 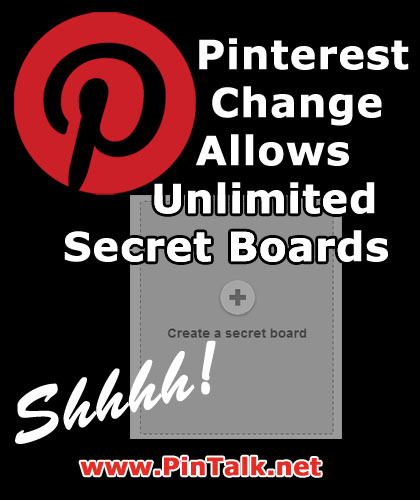 To create a new secret board click on the plus-sign in the lower left corner of the page. From here you will be guided through the same board creation process involved in setting up any new board. The second way to create a secret board is to click the plus sign next to your account name at the top of your Pinterest account. Choose create a board and you will jump straight to the ‘Create a board dialogue’. You can also get to this step by creating a new board when you pin or repin content. While naming the board and typing in a description, just click on the button to choose to make the board secret. If you don’t click secret now and save to board as public, there is no changing it and you will have to start over with a new board.